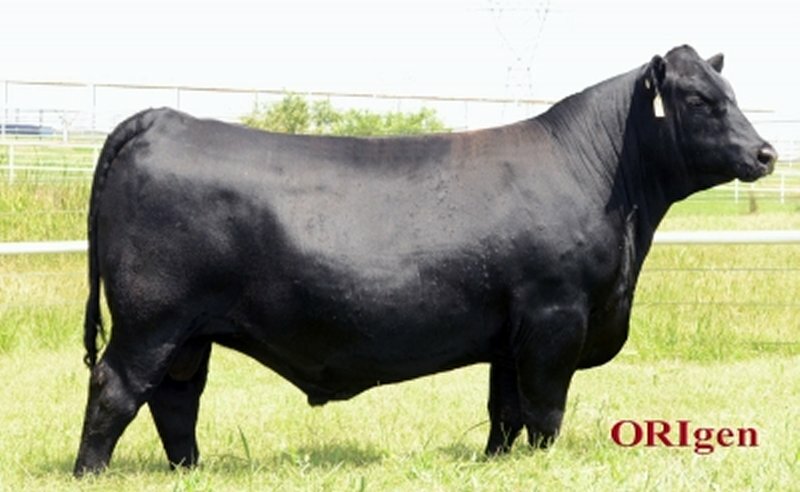 � The $200,000 half interest top-selling bull of the 2017 Express Fall Bull Sale from the very first calf crop by the ORIgen feature EXAR Stud who sold half interest for $116,000 as the top-selling bull of the 2015 Express Fall Bull Sale, this unique young sire had an IMF ratio of 106 and an adjusted 365 day ultrasound rib eye area measure of 16.3 square inches for a URE ratio of 107 which combined with his powerful genomic percentile rankings to make him, as of this writing, one of the highest $Beef value index and Rib Eye area measure EPD sires available from ORIgen where he ranks among the top six options for Residual Average Daily Gain EPD and among the top ten for hot Carcass Weight EPD and Yearling Weight EPD along with his top 1% rankings for $Feedlot value index and Weaning Weight EPD. � His dam, the $115,000 featured and top-selling female of Day 1 of the 2017 Big Event at Express, is an attractive and powerful young cow that ranks in the top 1% of the entire Angus population for Weaning Weight EPD, Yearling Weight EPD, Rib Eye area measure EPD, $Weaned calf value index, $Feedlot value index and $Beef value index with a top 20% Calving Ease Direct EPD and a Birth Weight EPD below breed average. 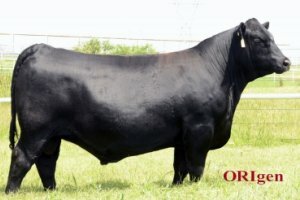 � Stallion represents the next step forward for America�s largest seedstock operation as they use the combination of his individual performance excellence and his genomic-enhanced EPD profile to continue and accelerate the advance of the Angus breed in the beef industry by shortening generation interval.